Join the National Agri-Marketing Association for the 15th annual NAMA Boot Camp, August 15-17, in Kansas City. Register Today! Join us for the MoKan NAMA Ag Tour on Wednesday, August 15! This is a one-day, on-farm experience where attendees will tour and learn about different nuances of agricultural operations in the surrounding area. Breakfast and lunch will be served as part of the tour and is included in the registration cost of $75. When you turn on the nightly news, frequently you hear an anchor reading tweets to you. Ad agencies talk about reaching out to food influencers for Instagram campaigns or fashion influencers on Snapchat. But farmers? How likely are you to have a business proposal that includes mention of farmers who tweet? Surely not. Well actually, you will. Janice Person (JPlovesCOTTON online) leads online engagement for Monsanto and will share insights on what online influencers in agriculture look like, what channels they are using and some of the things you may want to know before you end up in an awkward place asking about whether farmers know their way around an iPad. This interactive session will teach you the basics of the industry. You’ll learn about challenges and issues that producers face. You’ll also hear about the decisions they make and actions they take and when. You’ll walk away with an understanding of what a year in the life of a producer is like. This session will cover not just marketing basics, but the agri-marketing basics. Dave Lehman is a seasoned educator and long-time Student NAMA advisor. He has coached many marketing teams to success. Claudine Wargel, Anthro Insights, Inc. This session will explore research that describes farmers’ decision-making processes as they adopt new techniques and technologies. From studies focused specifically on decision-making, to those exploring specific product adoption behavior, this research can do much to help marketing communicators understand farmers and their business decision drivers. This session will refresh and inform attendees on farmer adoption practices, barriers and drivers – as well as how information and media fit into the adoption process. Negative messaging against agriculture run rampant in today’s world. Learn from a case study presented by the Monsanto Corporate Preparedness team about how to dispel those negative messages and create an open and engaging dialogue. Get the best practical career advice shared by over 30 leaders in agribusiness. Paulsen President, Sara Steever, interviewed some incredibly accomplished people in agriculture and brought together their most compelling ideas on scaling the ladder in our industry. From tips on networking to staying relevant to overcoming obstacles, you’ll get guidance from decades of experience in one session. If your career path is a journey, then are you navigating? Whether you’re just starting out or you’re well down the road, everyone can benefit from an experienced mentor to help them get the most out of their career. This interactive session will feature three successful agribusiness professionals who will provide practical advice, success stories and tips that you can apply right away for getting the most out of your career in agribusiness. Panelists will share their professional experiences and answer your questions. Faribault Woolen Mills | Join us to learn about a true American manufacturing legend. Nestled along the Cannon River, just south of Minneapolis, a nearly 150-year-old story is still being woven. Founded in 1865, the year Lincoln died, and the Civil War ended, Faribault Woolen Mill endures as one of the last vertical woolen mills in America. See how fifth generation craftspeople take raw wool and create blankets, throws, scarves and accessories of remarkable comfort and quality. Irreplaceable century-old machinery stands side by side with modern technology in our “new” mill, which was built in 1892. CHS Savage Terminal | The CHS Savage Terminal was built to provide producers increased access to export markets via the Gulf of Mexico. The terminal is located at Mile 14.5 on the Minnesota River. For over 30 years, this elevator serves as a transfer terminal which also has limited storage. Grain can be directly transferred to a barge from all 3 receiving pits. It has cleaning equipment and all concrete hopper-bottom storage tanks with a capacity of 560,000 bushels. To date, over 1 billion bushels of grain has been processed here since its opening in 1982. NOTE: To participate in the CHS Terminal tour please wear hard soled shoes (no-open toed shoes or tennis shoes allowed). And please wear long pants and long sleeves (or bring a jacket or sweater) to wear when inside the Terminal. The Good Acre | Eat a catered lunch while hearing the inspiring story of a local food hub, The Good Acre. The company’s mission is to strengthen farmers, food makers, and communities through good food. Good Acre personnel work year-round to connect their network of growers to wholesale buyers so that farmers can turn a profit on their hard-earned harvests and focus on being stewards of the land. In addition, The Good Acre provides space and the infrastructure necessary to wash, process, and store produce fresh from the field. They also offer this farm-fresh produce to their 450-member Farm Share program. They envision a vibrant regional food system where people grow, make and eat good food. We’ll learn about their operations and visit their warehouse, commercial kitchen, and hoop houses. 4:00 p.m.: Arrive back at the hotel. • Logo and name listed on the website, promotional brochure, emails, program guide and on signage. • If sponsoring a reception or break, the ability to use your own signage or distribute items. • If sponsoring a speaker, the opportunity to introduce them. • First right of refusal for next year’s event. Social media allows organizations to have conversations with consumers. But sometimes these conversations go south in a hurry. How should your organization respond? Participants will have the opportunity to consider various ways of handling social media conversations and negative comments. Our presenters are Katie Hayward, Senior Copywriter at Paulsen, and Clara Jacob, Creative Director at Paulsen. Katie is one of Paulsen’s social media experts. Her experience includes social media strategy, planning and execution along with handling U.S. social media for a global dairy organization. As a member of Paulsen’s social media team, Clara provides social media strategy and recommendations for some of Paulsen’s largest clients. The deadline for submitting nominations for the Professional Development Awards of Excellence is July 20, 2018. These awards will be presented at the 2018 Fall Conference, September 18-20, in Minneapolis, MN. Join NAMA & NAFB for a reception at the Ag Media Summit on August 6 at 9:00 p.m. at the Westin Kierland Resort & Spa. Join us after dinner for drinks and networking. The reception will be co-sponsored by the National Association of Farm Broadcasting. 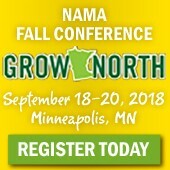 No need to register and no need to be a NAMA or NAFB member. Are you attending the Farm Progress Show in Boone, Iowa this year? If so, make plans to join other NAMA members at a reception hosted by the Cornbelt and Iowa NAMA Chapters. It will be a great opportunity to take a break and interact with other NAMA members on Wednesday, August 29, from 3:30 to 5:30 p.m. in the Exhibitor Food Building. It’s located outside of Gate #6 on the south end of Sixth Street and is part of the Van Wall building. Appetizers and drinks will be provided, compliments of the Cornbelt and Iowa Chapters. If you have any questions, please contact Carly Cummings (carly@farmher.com, (515) 210-5372) or Luann Pisarik (luann@jlfarmakis.com, (319) 631-2383). Join the Chicago NAMA Chapter for a discussion and reception at The Climate Corporation. Sean Arians, Director of Product Marketing: Data and Insights for The Climate Corp., will discuss his recent international experience as part of the Illinois Ag Leadership Program, then the group will take a tour of the office and partake in some networking and light refreshments. Sean recently returned from an international seminar as part of the Illinois Ag Leadership Program. The seminar allowed Sean to experience agriculture and culture in a few key U.S. trading partners in Asia. The trip consisted of visits to Hong Kong, Vietnam and Taiwan. Sean will share some of the experiences and takeaways of how the agriculture industry is impacted, as well as the personal impact of the 14-day experience.